2 Baby plum tomatoes -halved. -Beat the eggs in the big bowl then add fish sauce, oyster sauce,sugar and mix vigorously for about 2 minutes or until slight foamy on the surface. -Heat coconut oil in the pan,add tomatoes and spinach , cook gently until slightly soften. Turn the hop to medium heat ,then in goes the egg mixture. -Scattered feta cheese ,ground black pepper and basil leafs half way before the eggs mixture is fully cooked. -Depends on how would you like your eggs in the morning. I like Thai Style Omelette slightly soften which should take about 4-6 minutes before you can fold. 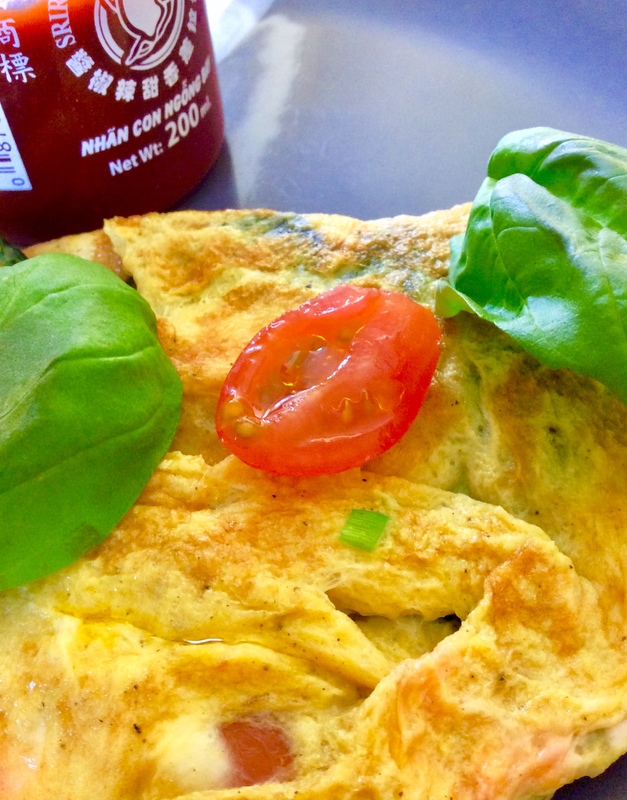 -I often lightly squeeze Sriracha sauce over the omelette and enjoy Thai Style Omelette. Tips: Try Thai Style Omelette with baby leafs salad and add some cooked or grated fresh beetroots…yum!